Hossack’s work is definitely my favourite. 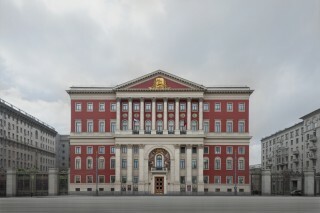 First, she photographed some splendid examples of Stalinist architecture in Moscow. They include city hall, the Bolshoi Theatre, a swimming stadium, and other familiar Moscow landmarks. Then, in what she calls “post-production” – a term some of us call “Photoshopping” – Hossack has removed cars, people, and flower pots from surrounding streets, as well as signs of air-conditioning and other modern additions to the buildings’ exteriors, and almost anything that was never part of the original architect’s plans. 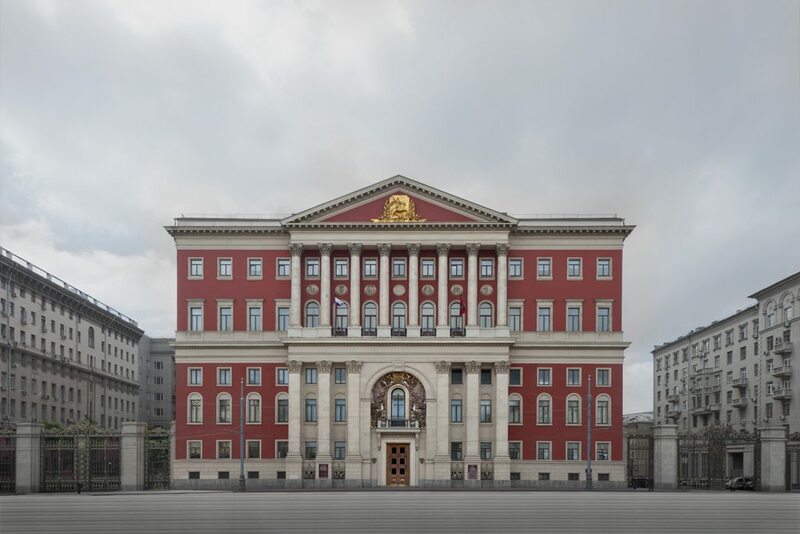 The result is an eerie spareness to these portraits of buildings. They are so uncluttered and precise that they look like architectural drawings rather than photographs. You can’t help but be drawn into these images. You stare and stare and feel a touch uneasy. You know that something is not quite right. But what is not quite right? In short: They are too perfect. They have been transformed from the real to the surreal. 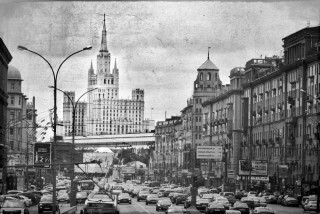 Moscow, I’m sure, has never looked better. Kudrinskaya, The Seven Sisters, Moscow, 2012. Photo by Abigail Gossage. Hossack and her three colleagues in Studio 255 travelled together to Moscow last June. They roomed at the same hotel but every morning, each headed in a different direction, each on a photographic mission. Barbara Bolton was off to create images of ghostly doorways, Abigail Gossage shot Stalinist skyscrapers, and Patricia Wallace sought out onion-domed Orthodox churches. The foursome has been operating as Studio 255 since 2007. They have travelled together to Paris, Berlin, and Moscow and they have jointly exhibited their works from all three cities. Their mentor and tutor is Michael Tardioli, the founder of the School for the Photographic Arts: Ottawa. Tardioli curated the exhibition Moscow Evidence. Some Russian diplomats attended the recent opening of the show on Dec. 14. They joyfully pointed out buildings on view that had served them as home, school, or workplace. Publicity materials describe the members of Studio 255 as “retired from demanding professional careers.” That’s a kindly term akin to the French euphemism describing women of a “certain age.” Indeed, there is a maturity and serenity to their photographs that is often lacking in the work of younger people with far less life experience. The foursome has not yet pinpointed the next city they will tackle. Their choices are not made quickly. Tardioli has instilled in them the lesson that they must do extensive research on any place they plan to visit and photograph so that they arrive with a detailed gameplan. As for Hossack, she is off to Kosovo in May as part of the Canadian Forces’ military art program. I’m sure she will return home with photographs I’ll want next year for Christmas. Moscow Evidence is on display at Michael Gennis Gallery, 416 Richmond Rd., until Jan. 13.